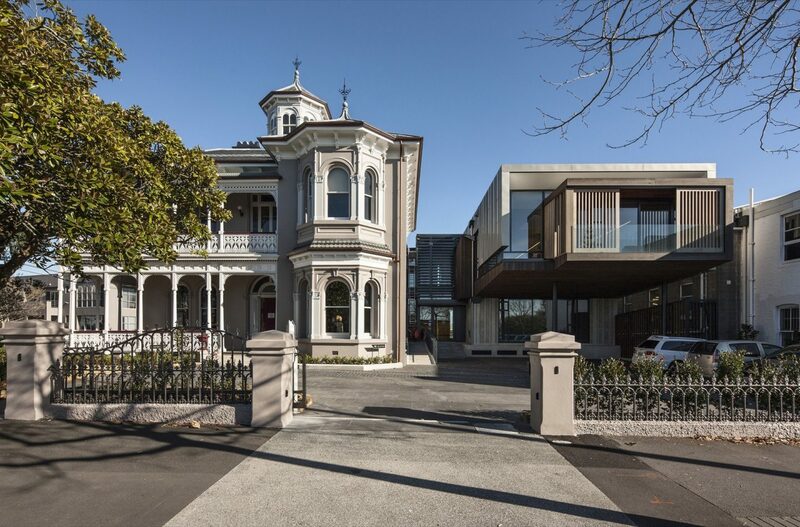 Salmond Reed Architects was engaged by ASB Community Trust as conservation architects to oversee a major refurbishment of their offices located in the elaborate and conspicuous residential building, “Allendale”, at 50 Ponsonby Road. Numerous alterations during Allendale’s lifetime, (including the lowering of ceilings in the ground floor), had resulted in haphazard levels of finish and inappropriate detailing. Salmond Reed Architects’s recommendation was to undertake a complete retrofit of services, a seismic upgrade and restoration of as many heritage details as possible, including the raising of the ceilings and reinstatement of original spaces. The process also included total interior and exterior redecoration. 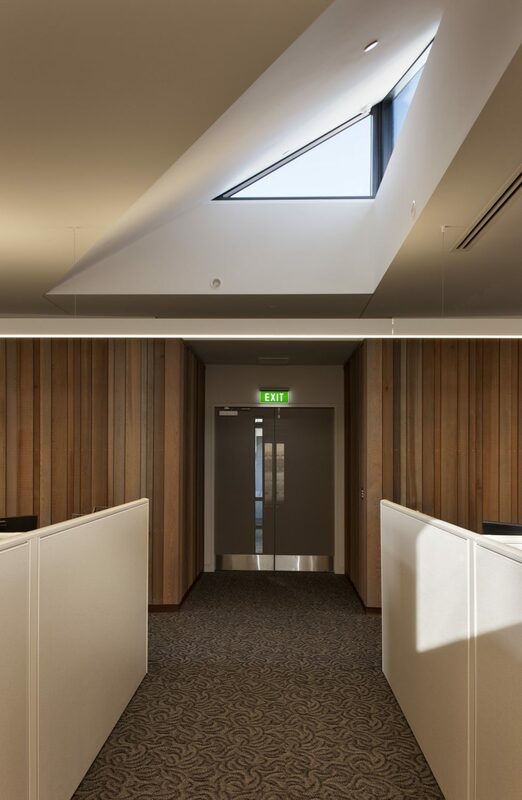 This refurbishment process led the clients towards reanalysing their office accommodation and, as a result, Salmond Reed Architects’s work expanded to include design of a new annexe building on an adjacent site formerly occupied by an earlier addition that was in poor condition and no longer fully met their space requirements. 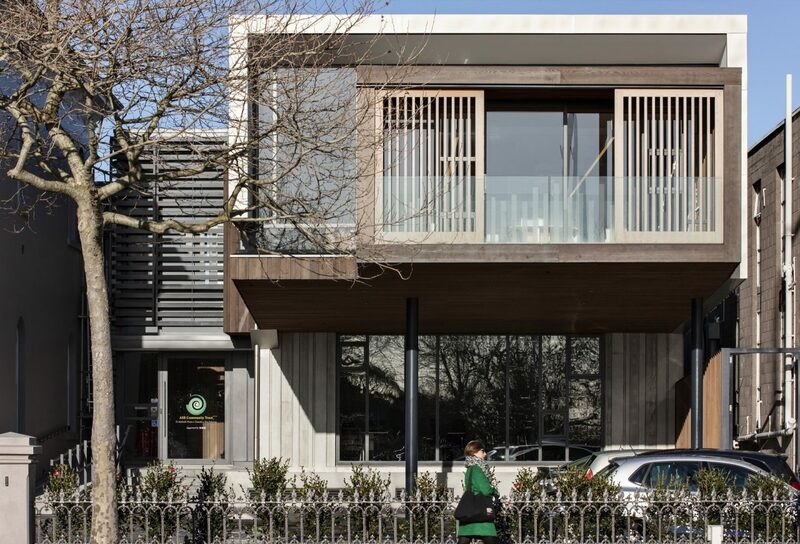 The new two-storeyed structure, housing an upper floor open plan office and modern well-equipped meeting spaces, provides a transition between the existing heritage building and the adjacent Ponsonby Road retail frontage and deliberately adopts a strong contemporary character to emphasise the architectural integrity of the original villa building. Outwardly restored and redecorated, Allendale House now integrates modern facilities, services, furniture and fittings that recognise their important heritage context, but speak equally of the villa’s contemporary function as a corporate head office. Part of Salmond Reed Architects’s brief when upgrading office facilities in the distinctive Allendale House, was to re-consider an addition built on the adjacent site. Built in the1990s this adjunct building was, by 2010, recognised to be inadequate for the client organisation’s future growth. A new Annexe building, more fully utilising the adjacent site’s potential but designed to comply with existing District Plan Rules, was the sensible proposal to provide the requisite basement and off-street parking, two board rooms and quality office space for eighteen staff. 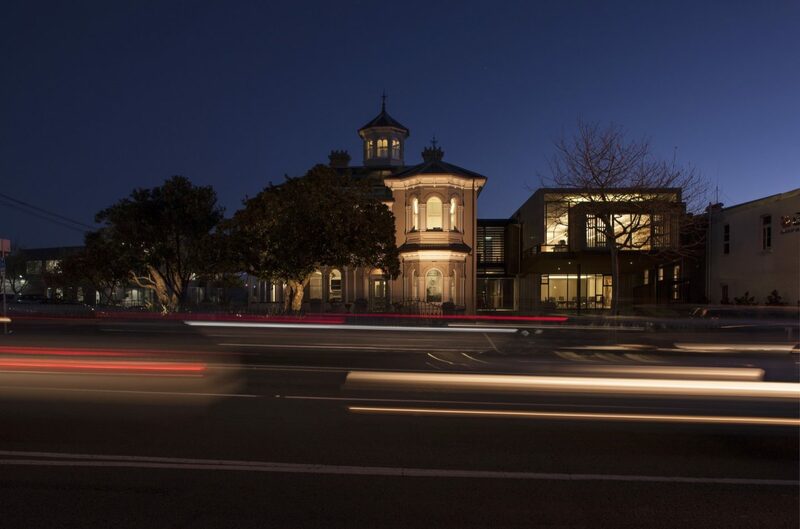 The new building was to have its own identity, acknowledging its lavishly detailed Victorian neighbour without compromising or challenging that building’s heritage status. It also needed to take consideration of the site’s 1.5 metre full-length air and light easement, which could not be built over. This beautifully built two-storey building rises to the challenge. Built to an exceptionally high standard, it displays a modesty and restraint appropriate to its occupant and a great respect for its Victorian neighbour while offering a restful, purposeful environment for its users. Within these constraints the new building is taken to its maximum permitted height. Its form, surging forward whilst minimally supported in space, evokes lightness, despite its mass, to contrast against the adjacent, well-grounded heritage building. 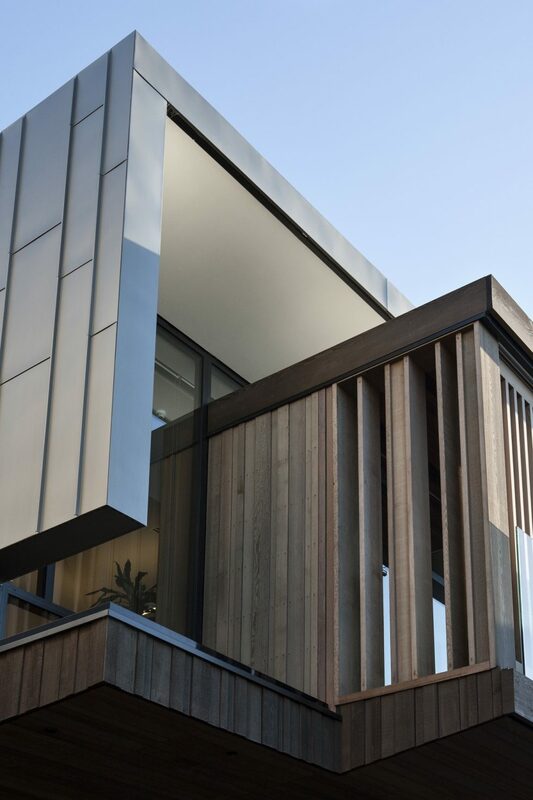 On the exterior, a series of recessed ‘negative’ elements sets up a rhythm for material changes and asymmetry featuring concrete, stained cedar, zinc and glass-a limited palette of materials and colours which take their cue from the old building. Basement car park access is gained by driving through Allendale’s former stables, now read in their original form via the fully glazed rear stair, a part of the “link” between the old and new buildings. 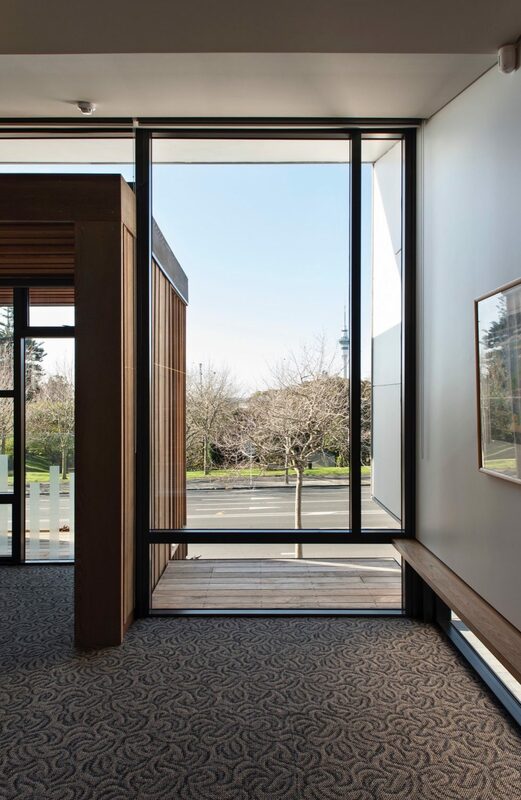 The deceptively simple upper floor office space opens to the cantilevered deck via sliding doors, while timber screens to this area control light and view. This large cantilevered overhang frees up space for off-street parking outside the new boardroom complex. While the adjacent restored and redecorated Allendale House now integrates modern facilities comfortably and respectfully into their solid heritage context, this new Annexe building, housing the necessary modern facilities and expansion space, acts as a contemporary foil against its Victorian neighbour. Typical of its time, the house is constructed from plastered brick, with wooden floors and a slate roof. Originally the exterior finish would have been simply unpainted, plastered masonry with colour being used only on the joinery. However, during its history paint had been applied overall and, as part of a total services upgrade and refurbishment of the building, it was proposed to select an appropriate new colour scheme. 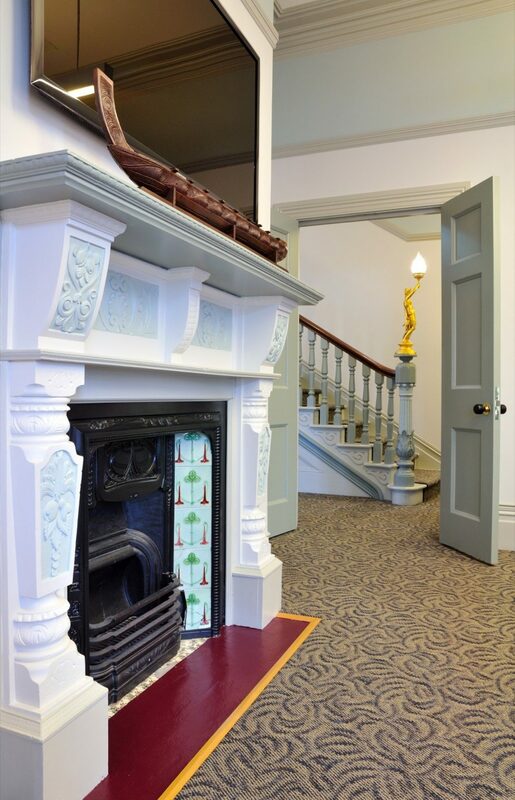 The challenge lay in avoiding the temptation to over-emphasise with colour the rich decorative detailing of the building, instead opting to convey an under-standing of the total composition by selecting colours that reference the original lime-based plaster finish. Articulation of the detail, instead of being ‘picked out’ in a variety of colours, is achieved, as originally conceived, through the play of light and shadow on similarly coloured decorative elements. 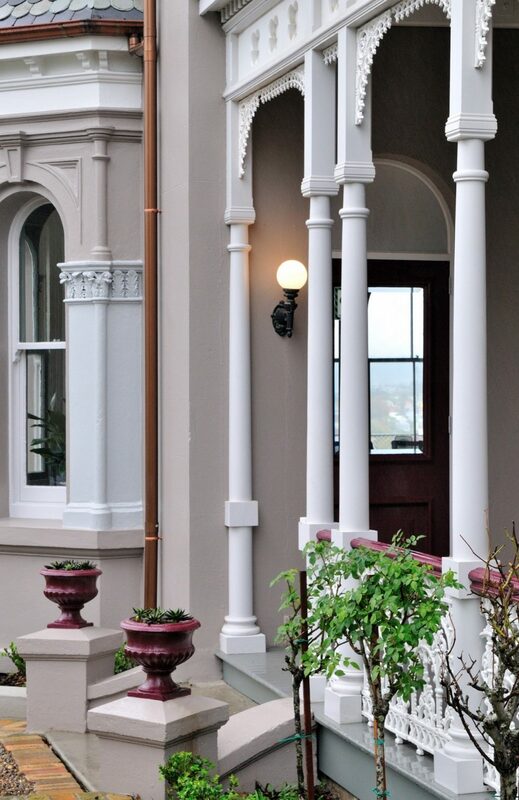 This colour scheme received a Resene Total Colour Maestro Award 2013 and a 2013 NZIA Resene Colour Award. The exterior palette is echoed in an equally restrained interior scheme where, under differing lighting conditions the colours work to reflect a generosity, warmth and energy befitting the home of Australasia’s largest philanthropic Trust. Although deliberately limited, the interior palette nevertheless demonstrates and emphasises an understanding of the hierarchy of architectural elements which typify the villa style, while at the same time recognising the contemporary function of the house as a corporate office. Allendale’s heritage status (listings with both NZHPT and Auckland Council) meant that consultation with—and approval by—both authorities was an essential part of the process and a resource consent application was a necessary pre-requisite to any repainting. Additionally, an awareness of the position the building holds in the hearts of the neighbourhood which “owns” it was also a very positive influence guiding the direction of the resultant colour scheme. 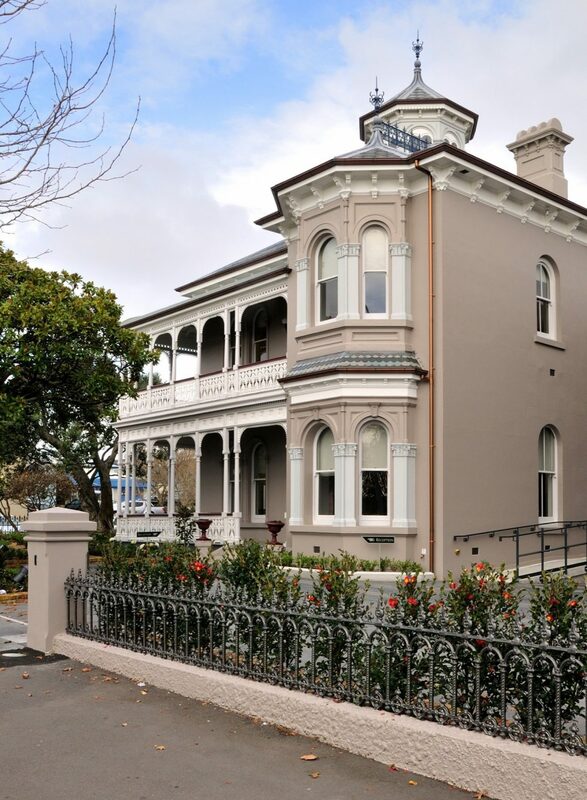 The comprehensive refit of this Category 1 Italianate, double-bay villa includes seismic upgrading and restoration of many original beautiful historic features. The level of detail in the news building provides depth and modulation to the new facade, avoiding the blandness of a very modern approach and balancing the decoration of the villa.